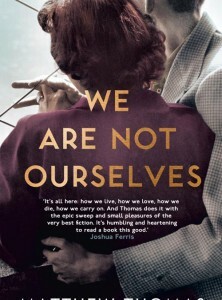 A panorama of twentieth-century North American family life rolls across the screen of Thomas’s astonishingly mature debut novel, ten years in the writing and drawn from personal experience. Its central characters, Ed and Eileen Leary, personify the immigrant energy, social aspiration, financial concerns and middle class values of the USA in their era. ‘Your family is good people,’ son Connell is told. But bad things happen to good people and dementia arrives to reshape the trajectory of this nuclear unit. 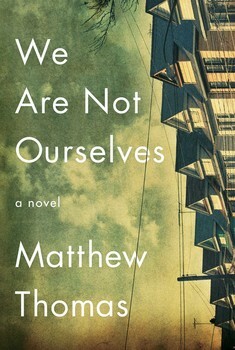 Tender and wrenching, the novel offers one particular family’s response to human fate. Eileen, the primary character, is the daughter of a working-class Irish family who grows up in the shadow of her father’s charisma and the darker moods of her alcoholic mother. A child of the 1940s and ‘50s, Eileen is bright and aware, conscious of her social class and lack of privilege compared to some. She is determined both to find a career and a good enough partner, a clever man whose work will simultaneously fulfil her and lift their marriage on to a higher social plane. That man is Edmund, a neurobiologist and teacher whose stubborn nature and beliefs lead to him turning down multiple opportunities for professional advancement. Eileen’s frustration at these choices made about her life without her consent is tempered by her admiration for the partner she has chosen. And Eileen also makes choices for the pair of them, pushing Ed into home ownership, first in Jackson Heights, a suburb of Queens, New York, that will see significant demographic shifts in years to come, and later in Bronxville, an upmarket Westchester commuter town that accords better with Eileen’s sense of a fit neighborhood. Moving gracefully, vividly across the years, Thomas employs a realistic but not wholly linear mode. His narrative proceeds in slices – microscope slides, perhaps – of life. A current preoccupation, a professional dilemma, a moment of crisis – these snapshot episodes are fully visited but not always returned to in subsequent chapters. The effect is to light up a personality through flashbulb instances that accumulate into a composite character portrait. A stressful inspection at Eileen’s hospital (she is a nurse); Connell’s struggles with neighborhood bullies; Ed’s efforts, as his powers start to fade, to imbue sporting qualities into his son – these small jigsaw pieces of marriage and parenting, of the tensions, private dilemmas and compromises of shared lives are deftly, subtly delineated by Thomas as he proceeds inexorably towards Ed’s descent into early-onset Alzheimer’s. Connell’s and Eileen’s responses to the harrowing process of the illness through its multiple phases reflect a corresponding multiplicity of facets in their own evolving personalities: shame, weakness, loyalty, guilt. Thomas cleaves to the long arcs of experience, the wheels turning, the ever-developing roles of father, mother, son. His novel, spanning fifty years, continues to move forward beyond Ed’s demise, coming to rest as the circle turns once more and Connell and Eileen’s roles revise themselves for the last time in our vision. This American epic offers a feast of mature storytelling. Cooler in the opening phases of Eileen’s childhood, it hits its proper stride once Eileen and Ed have found each other and begun married life. Through their quotidian struggles and fluctuating feelings, an enduring evocation of everyday intimacy takes shape, one that is not expunged by Ed’s departure. In the closing pages, Eileen, now a widow, takes a trip back to Jackson Heights, to see what it was she so insistently forced her family to abandon. Happily, she discovers that the tenants from the old house have moved on and found their own success and happiness. ‘I hope you have a lovely big backyard. I hope you flip steak and watch your daughters run around and think, I could die in peace,’ she wishes, in response to the news. Such simple – and American – blessings, but not granted to everyone.